I have more or less completed the Dark Nebula astrography and map after re-reading the Aslan and Droyne alien modules. 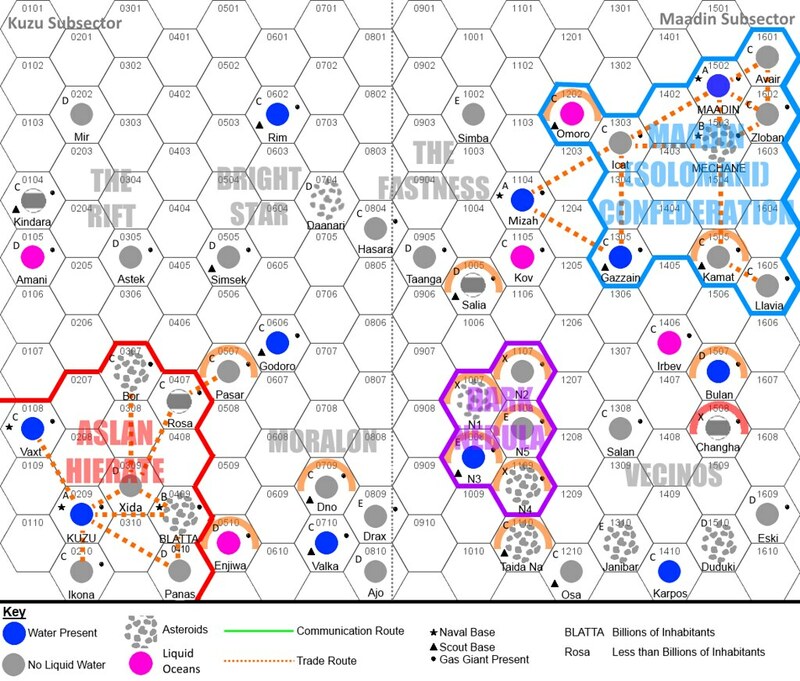 In addition to completing the starports and bases for all worlds, Aslan and Dryone included, I have also added trade routes. Note that Mizah is the only Rich world in the Dark Nebula - I have downgraded its population to 8 so that there will be one Rich world on the map. It also fits my view of Mizah as an aristocratic "Casablanca" and neutral player better than an industrial world. Also note that the trade routes are mostly within the two main polities. These are from Industrial worlds to Asteroid, Desert, Ice-Capped, and Non-Industrial worlds within 4 parsecs from them; and from the Rich world (Mizah) to the nearby agricultural world (Gazzain). I have also connected Mizah and Gazzain to the main Solomani trade network. You can find the world data HERE.